In this experiment the number of gram-atoms of each of two elements in a binary compound will be experimentally determined. From this information, the empirical formula of the compound will be determined. Using mass relationships show that magnesium and oxygen combine in a definite whole-number ratio by mass. Do not touch a hot crucible with your fingers, and be sure you use tongs to shift the position of the hot crucible cover in step 3. Use a hand to waft the gas given off in step 6 to your nose. Avoid directly inhaling reaction product gases. Do not pace any magnesium ribbon in an open flame. 1. Clean a crucible and cover. Dry them by heating them in the hottest part of a burner flame for 3 minutes. Allow them to cool. Measure the mass of just the crucible and record this as (a) under "Observations and Data." 3. Cover the crucible and place it in a clay triangle (Figure 13-1). Heat gently for 2 minutes. Using crucible tongs, carefully tilt the cover to provide an opening for air to enter the crucible. Heat the partially covered crucible strongly for 10 minutes. 4. Turn off the bur burner cover the crucible, and allow the con­tents to cool. When the crucible is cool enough to touch, remove the cover and examine the contents. If any unreacted magnesium remains, replace the cover at a slight tilt, and reheat the crucible strongly for several minutes. 5. Put the cover all the way on and allow to cool. After making sure that all the magnesium has reacted, use a dropper pipet to add enough water to the crucible to just cover the contents. Wash any material that may have spattered onto the inside of the cover into the crucible. 6. Holding the burner in your hand, gently heat the contents of the uncovered crucible by moving the burner slowly back and forth. Avoid spattering. Observe the odor of the vapor given off by wafting it toward your nose. Record your observation as (d). 7. When all the liquid has boiled off repeat steps 5 and 6. 8. When all the liquid has boiled off a second time, strong y heat the uncovered crucible for v minutes. 9. Turn off the burner and allow the crucible and contents to cool. Measure the combined mass of the crucible + contents (c). 1. 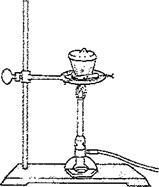 Write the empirical formula of the oxide of magnesium based on your calculations from this experiment. 3. Why is the ratio found in question 2 different from the ratio found in calculation 5 above? 4. In a chemical formula, explain the significance of subscripts in terms of atoms and molecules. In terms of gram-atoms and moles. 5. The molecular formula of hydrogen peroxide is H2O2 What is its empirical formula? 6. How is the chemical composition of carbon monoxide, CO, similar to that of carbon dioxide, CO2? How is it different? 7. A sample of sulfur having a mass of 1.28 g combines with oxygen to form a compound with a mass of 3.20 g. What is the empirical formula of the compound?